Today, all schools have a level of diversity among their students. As educators, we work to find ways to ensure that all students are included and feel a sense of belonging in their classrooms. Student Diversity is an excellent resource for new and experienced teachers looking for ways to help their students be successful. This book is easy to read and has many ready-to-use reproducible worksheets. The student examples demonstrate how students with different levels of competency are able to complete activities using the strategies presented. The classroom stories show how ideas are used in a classroom and how teachers can incorporate ideas into their own teaching. 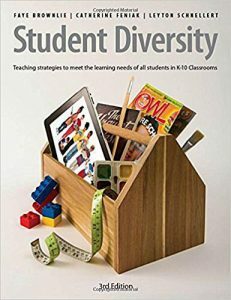 Student Diversity provides teaching strategies across the curriculum with chapters on reading, writing, mathematics, science and social studies. Having specific examples of assessment and how to use assessment to guide and inform practice is valuable in meeting the needs of students. Classroom Connections: Teachers looking for ways to co-teach and work with the learning resource teacher in the classroom will appreciate the explanations and stories of success.